The internal battery needs to be charged before use. The power lamp is lit in green when charging starts. The power lamp is unlit when charging is done. If the power lamp flashes in red, remove the USB cable and stop charging. Use the provided USB cable for charging. It may take time for the battery to charge or the battery may not charge at all when a USB cable other than the provided USB cable is used. Connect directly to a USB port on your computer. Do not connect via a USB hub. It may not be possible to charge via some USB hubs. When charging, be sure to insert and remove the USB cable while the computer is turned on. 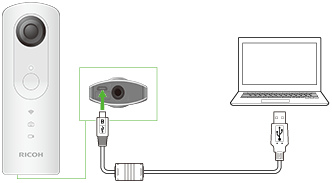 If the computer is restarted while the USB cable is inserted, the computer may not recognize the camera. The camera is charged in approximately 240 minutes (at 25°C). The time above is a guide for full charging. The charging time differs according to the remaining battery capacity. If the battery capacity is low, it may take a while for the camera to be recognized by the computer.